In 2016, 85 percent of all legislative races in Georgia were unopposed. The vast majority of those races were Republican seats. This year, we have progressive candidates running in districts that haven’t been contested in a decade or more. EVERY progressive candidate matters. Even in deeply red districts, they promote Democratic values, they make conservatives spend money and effort, they build a base, and they draw out voters. Every one of them deserves full support, effort and admiration. The countdown has begun for the 2018 Midterm Elections on Tuesday, Nov. 6. 159 Georgia Together, Necessary Trouble Indivisible Group and Science for Georgia have joined forces to create the 2018 Midterm Project: Voter Guide for Georgia, with a special emphasis on flippable districts and on districts we need to protect. The project has been possible through the assistance of volunteers from many of Georgia's progressive action groups. Thank you! First, check out important dates for voting and links to make sure your registration is up to date and numbers to call if you run into trouble voting on our Voter Basics Page. This year, all of Georgia’s 14 congressional districts will be on the ballot. 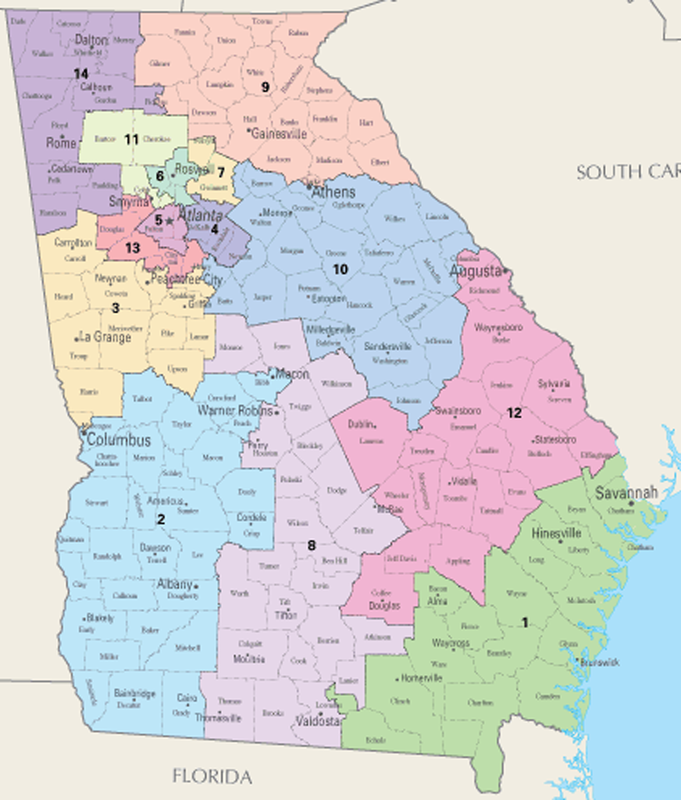 Of the 14 congressional seats in Georgia, 10 are held by Republicans. This year, ALL of these 10 have Democratic challengers, and two (U.S. 6 and U.S. 7) are being watched as they are considered potentially flippable. This year, neither governor, lieutenant governor, secretary of state nor insurance commissioner have incumbents running, which gives Democrats a stronger shot at those offices. The first three of those positions (plus attorney general) will have especially important roles in upcoming voting rights issues, such as redistricting, voting machine replacement and voter purges. The role of insurance commissioner has become even more important given the precariousness of health care. The Public Service Commission is on all of our radars because of the travesty of consumers footing the bill for nuclear plant construction at Plant Vogtle. In the Georgia House, progressives need to protect gains made in House Districts 101, 117, 119 and 138. We also have a number of flippable House seats: 37, 40, 51, 52, 54, 79, 80, 95, 105, 106, 107, 108, 111, 145 and 151. House districts that are also worth watching: 43, 48, 50, 102 and 147. In the Georgia Senate, progressives need to protect the gains made in Senate District 6, while working to flip districts 17, 23, 40 and 48. Senate districts that bear watching include 32 and 56. We must learn from the past, continue to resist being complacent, and act strategically as we move forward with bringing progressive change to Georgia one county at a time.